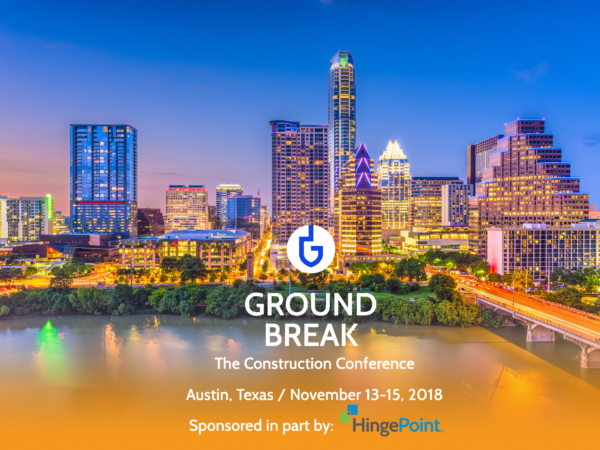 Check out the HingePoint Booth (#317) at Groundbreak 2018 in Austin, TX, November 13-15 2018. Groundbreak is THE construction conference of the year, with over 3,000 attendees representing top ENR companies, over 70 sessions on topics such as hiring during a labor shortage, AR/VR, increasing job site productivity, leveraging technology to maximize ROI, and getting the most out of mobile, plus, work alongside developers at the industry's only Innovation Lab. HingePoint is thrilled to attend this event as a vendor. After all, we consult, develop, and integrate software for the construction industry. When and Where is the Groundbreak Conference? Groundbreak is November 13-15, 2018 at the Austin Convention Center in Austin, TX. You can visit Procore.com/groundbreak for details on the event or click HERE to register and purchase your tickets. The Cost of Groundbreak Conference? You have until April 30, 2018, to purchase tickets at the early bird price, which is currently $995 (a $300 savings off the full price of $1,295). Afterward, ticket prices will increase to $1,095. Tickets purchased after 8/31/18 will be $1,295, so be sure to purchase your ticket(s) now! HingePoint offers cloud and mobile applications for construction and real estate that are easy to adopt and employees love. Specializing in the systems that run the construction and real estate business including SharePoint, Salesforce, Procore, MS Dynamics, and Autodesk. Scale and grow profitably with Financial and Project Management Dashboards, document management, and workflow automation for field to office collaboration. [post_content] => Last week, the HingePoint team traveled south to San Antonio, TX to learn about The Great Game of Business and was awarded 1st place, winning the coveted Mini Game Challenge! The Great Game of Business is designed to show how an open-book management system is used to build rapid financial results and company culture. The full-day workshop kicked off with a keynote by Michael Kiolbassa, president of Kiolbassa Smoked Meats. Kiolbassa implemented The Great Game process in 2014 to save the family business that was struggling to make a profit. In fact, at one point in August and September of 2013, they “lost more money in two months than we made in most years we had been in business”. Now, just three years after adopting The Great Game Process, Michael's company is thriving and on track to hit a target of $100 million in revenue by 2019! The keynote was followed by an on-site visit to the Kiolbassa factory, where we sat in on a live "Huddle" to see Great Game practices first-hand, and a Q&A with employee practitioners. The last part of the workshop was the interactive session, where the teams competed in the coveted "Mini Game challenge" and put the days’ worth of professional development and learning into action. Teams were challenged with building a short-term activity designed to correct a weakness or pursue an opportunity in the company. The requirement was to have an end goal with a time-frame, scoreboard, and reward for winning. HingePoint’s game was named “A Steak in the Outcome” with the reward being a steak dinner for the team at Ruth’s Chris if the criteria are met. The competition was very tight, making a difficult decision for the judges. After a lengthy deliberation, the results were announced, awarding HingePoint the victor! By the end of the day, the HingePoint team left with the knowledge of how to get started with open-book management and unique skills to continue pushing HingePoint forward in the years to come! HingePoint provides Procore, SharePoint and Salesforce consulting for Commercial Real Estate and Construction companies. HingePoint also helps the AEC industry with development & integration of AutoDesk and Procore products with enterprise systems. We are a trusted partner with over 25 years’ experience of systems development and integration work in the AEC industry. Our clients range from top hotel brands and restaurant chains to AEC firms and real estate developers and Facilities Management. We provide BIM consulting with ROI. Results Guaranteed…Literally Guaranteed. [post_content] => CEO of Microsoft Satya Nadella said businesses are in the middle of a digital transformation. Microsoft has one of the most diverse crowds of 30,000 people at its annual conference, Microsoft Ignite. The diversity of roles and functions is unlike anything Microsoft has seen. "The most critical thing for us is to bring all of us across functional roles and expertise to support this process of continuous change and renewal." Technology should enhance work and life. It should help humans be more productive while helping embellish human life. Nadella rhetorically asked, How are we going to use technology to empower people? That is precisely Microsoft's mission. Empower every person and organization on the planet to do more. "We do not want to degrade humanity" with technology, he said during his keynote in Orlando, Florida. To enable the digital transformation, Microsoft works in four key areas, empower employees, engage customers, optimize operations and transform products. To do so, Microsoft is working in artificial intelligence. For example, the keynote was being live streamed across the world, and artificial intelligence was translating the keynote in 12 languages simultaneously. They're also making a big push in alternative reality. While virtual reality has been big in companies like Autodesk. Microsoft is honing in on a more encompassing reality, mixed-use reality. Microsoft is going after mixed-use reality to increase collaboration. It's where virtual reality, augmented reality and holograms are added into an immersive and often physical work environment. Ford is using Microsoft's mixed use reality to design cars. Before car companies would make huge clay models to review their models. Take bumpers. Designers would physically change the bumpers so engineering and designer can approve a new model. Now, Ford designers and engineers can put on a virtual reality headset like Hololens, and see digital models. They can interchange multiple bumper models. The digital models even have safety and regulatory data in them. For example, if a designer changes how a rear view mirror looks, the Hololens will show how the new design changes what the driver sees. The mixed-use reality reduces leaks because it controls who has access to confidential information. You can even verify your identity with your phone and it securely logs you into the team collaboration platform. Someone can even work in two different physical places in the same virtual environment while working on the same physical product and seeing the same digital models. Windows is creating a new mixed reality headsets to help with mixed-use reality. Microsoft has positioned itself as the software platform to conduct business. With the advent of the cloud and it's many offerings, it's going to be hard to find a better solution for business. HingePoint is headed to Microsoft's Ignite conference. It is day one. We will be updating our blog here for updates. Are you managing your entire company from a spreadsheet? How are you going to grow with those document management tools? Does your SharePoint work the way you want it to? If you properly implement SharePoint, it will transform your company's productivity. Employees will be more efficient, you'll have better access to your company's data, and you'll be able to better report on key metrics. HingePoint’s custom SharePoint solutions have helped many companies struggling with unorganized data and manual, multi-step processes. Those same customers have transitioned into a more organized, productive organization through automated workflows and easy-to-search information. [post_content] => Join HingePoint, as we share how architects can leverage technology trends to be successful in today’s AEC industry. With the fast paced growth of technology spreading throughout the industry, such as BIM and VR, we want to show you what works. The American Institute of Architects Dallas (AIA Dallas) and TEXO present TAP-IN Aug. 4 in Dallas, an event that offers insight to architects on available technology for building design and construction. Bryce Finnerty, HingePoint’s Chief Solutions Architect, will open TAP-IN to show architects how to use the right kind of technology. Finnerty will also give participants a aadmap to becoming a architect who uses BIM. Tap-In will outline the big technology trends affecting business and our industry. Participants will learn practical examples from cloud, mobile, 3D models and BIM to help you plan for and leverage these tools. A wide variety of firms will be discussing their research, development, collaboration and implementation of technology in a series of short lectures and panel discussions. Participants at the Tap-In event will also get a free lifetime license for the BOM to Excel Revit Productivity App designed especially for 3D BIM Modelers by the team at HingePoint. This app is designed for Architects, to automate the busy work that consumes valuable time. In the push of a button, and within a minute of downloading the App, the BOM App for Revit will automatically build a BOM, quants and take offs from all your Revit Schedules and Export them to Excel. Saving hours and hours of scheduling, manual take offs, and formatting Revit data in Excel for clients and colleagues. Don't want to wait to until Tap-In to give the Revit BOM to Excel productive app a spin? No problem, check out the section below to install the free trial now! Just click the button below to install the limited time trial version of the app. Attend the AIA Tap-In event we'll convert your license to a perpetual license. Just email ContactApps@hingepoint.com and tell us you saw our talk and are part of the Dallas AIA. We will upgrade your license from Trial to Perpetual and you will own this $900 app for life. At no cost to you. Install the free trial today and you will be well on your way to automating, reporting, estimating, quantities, take offs, at the push of button! or participating in the AIA Dallas technology conference, we'd like to give you a roadmap to show the steps needed to create 3D BIM models. Whether you're working with paper or already using digital files, you can learn necessary steps to relaunch your company's processes with new technological capabilities.